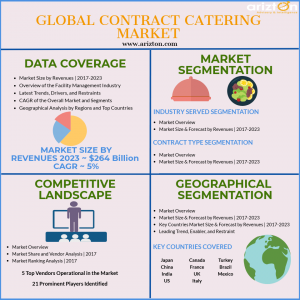 CHICAGO, IL, UNITED STATES, August 20, 2018 /EINPresswire.com/ — Arizton’s recent research report on global contract catering market forecasts that the global market revenue is likely to cross $264 billion by 2023, growing at a CAGR of around 5% during 2017-2023. The growing trend of 15-minute deliveries, and access to unimaginable choices and diverse plates is one of the key factors attributing to the growth of the global catering market. Similarly, The launch of innovative concepts and the move towards sustainable, better-for-you foods, development of street food, and grab and go options will boost the global contract catering market revenues. The vendors are investing in developing more streamlined and transparent services to gain a larger catering market size. Looking for more information? Download a sample report. The report provides comprehensive industry analysis, trend forecasts, and competitive analysis. The research study segments the market by industry (B&I, education, healthcare, senior care, and others), by contract type (fixed price, cost-plus, and others), by geography (North America, Europe, APAC, and ROW), and offers detailed competitive analysis. The global contract catering market is divided into three major segments in the report that consist of industry, contract type, and geography. 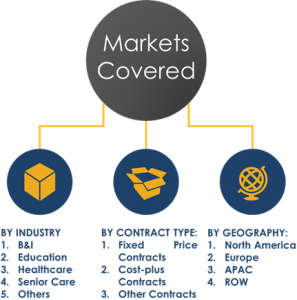 The global contract catering market by industry served is categorized into B&I, education, healthcare, senior care, and others. B&I industry dominates approx. 1/3rd of the total market share. Healthcare dominated the third largest market share in 2017, growing at a CAGR of more that 5% during the forecast period. The growing demand for meals that categorized into high calories, low fat/low sugar, or meals with certain excluded ingredients, easily digestible, and chewable properties is driving the growth of the healthcare segment in the global market. The caterers are focusing on providing quality food services at affordable costs for health-conscious consumers to gain a larger global contract catering market share. The introduction of attractive, high nutrient food menus, restaurant-style menus, grab and go concepts, room service, on-demand dining, vending options, and hybrid models will transform the global market over the next few years. The vendors are also creating wellness-focused meals that combine creativity with nutrition science to attract maximum number of consumers in the market. The formalization of meals according to individual patient’s requirements will help companies boost their revenues in the global contract catering market. 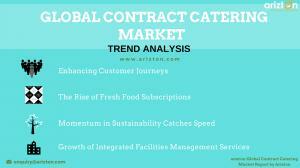 The contract type segment in the global contract catering market is classified into fixed price, cost-plus, and others. Fixed priced contracts occupied the largest market share in 2017, growing at a CAGR of approximately 5% during the forecast period. Others segment to grow at a CAGR of around 6% during the forecast period. This type includes nil subsidy contracts where the caterer recovers its overhead costs and earnings from the gross profit that it earns from sales, at no risk or cost to the client. The increasing trend of implementing lesser risk-free contracts is propelling the growth of this segment in the global market. The launch of innovative concepts and the move towards sustainable, better-for-you foods, development of street food, and grab and go options will boost the revenues in this segment in the global contract catering market. In countries such as India and China these nil-subsidy catering options are gaining momentum and have lucrative growth opportunities in the near future. The growing acceptance of royalty contracts that offer incentives to both the caterer and the contractor will transform the global contract catering market over the next few years. Request for a sample for more information. The global contract catering market by geography is divided into North America, Europe, APAC, and ROW. APAC dominated the majority of the market share in 2017, growing at a CAGR of approximately 6% during the forecast period. North America to grow at a CAGR of more than 4% during the forecast period. The growing requirement for personalization, fast service, and convenience across various end-user segments are some of the factors attributing to the growth of the North American market during the forecast period. The varying preferences for items on the menu have led to a demand for flexible food operations in the global contract catering services. Exemplary service is also being looked at as companies redesign spaces to ensure seamless, reduced service times. The trend towards automated technology for order taking in response to the demand for convenience will transform the North American region in the global contract catering market. •	The Genuine Dining Co.